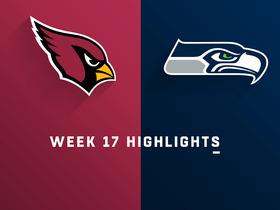 Cooper is active for Sunday's contest against the Rams, Darren Urban of the Cardinals' official site reports. Analysis: Cooper will attempt to get payback less than a week removed from his former employer cutting him loose. He likely hasn't had a enough time in the system to get reps in a receiving corps that's highly lackluster outside of Larry Fitzgerald. However, Cooper's All-Pro pedigree as a returner could be on full display. The Cardinals claimed Cooper off waivers Wednesday, Field Yates of ESPN reports. Analysis: Cut loose by the Rams a day earlier, Cooper quickly found a new home in the NFC West. He was named to the Pro Bowl as a return specialist last season, but he played a role in two turnovers during a playoff loss to Atlanta, then dealt with an ankle injury for much of 2018. The woeful Cardinals have nothing to lose by giving Cooper a look on special teams. The Rams waived Cooper on Tuesday, Myles Simmons of the Rams' official site reports. The Rams officially activated Cooper (ankle) from injured reserve ahead of Monday's game against the Chiefs, Clarence Dennis of the team's official site reports. The Rams are planning to activate Cooper (ankle) from injured reserve prior to Monday's game against the Chiefs, Ian Rapoport of NFL Network reports. 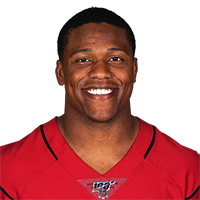 The Rams designated Cooper (ankle) to return from injured reserve Tuesday, Lindsey Thiry of ESPN.com reports. Analysis: Thus, Cooper's 21-day window to practice and prove the health of his ankle has opened. If he returns to the 53-man roster, his standing on gameday would be in question. In Cooper's place, Jojo Natson and Blake Countess have performed adeptly as punt and kick returners, respectively. 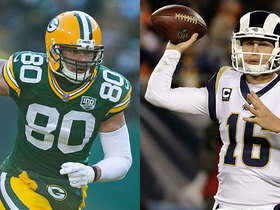 As such, Cooper may have to wait for an opportunity to present itself, whether it's via injury or lack of performance. Head coach Sean McVay said Monday that Cooper (ankle) is physically able to play, and there will be more clarity on his situation as the week unfolds, Myles Simmons of the Rams' official site reports. Cooper (ankle) was placed on injured reserve Wednesday, Myles Simmons of the Rams' official site reports. Analysis: Cooper, the Rams' standout return specialist, is dealing with an ankle injury that will require a multi-week absence. The Rams re-signed Jojo Natson on Wednesday to help out in the return game. Cooper (ankle) could miss multiple weeks according to head coach Sean McVay, Rich Hammond of The Orange County Register reports. Analysis: Cooper suffered an ankle injury during Monday's win over the Raiders and could now be in danger of missing a handful of games. Even worse, backup returner Mike Thomas is also dealing with a groin injury. Look for updates once the practice reports are released this week. Cooper is questionable to return to Monday's game against the Raiders after suffering an ankle injury. Analysis: Cooper has managed 75 yards on three kickoffs and just 12 yards on two punt returns Monday night. If he is not able to return to the contest, look for Cooper Kupp and Mike Thomas to potentially take over his responsibilities on special teams. Cooper brought in three of four targets for 22 yards and a touchdown and returned one punt for nine yards in the Rams' 21-20 preseason win over the Texans on Saturday. Cooper underwent shoulder surgery after last season, Rich Hammond of the Los Angeles Daily News reports. Cooper was involved in two special-teams turnovers in the first quarter of Saturday's 26-13 loss to Atlanta in the wild-card round. Cooper (shoulder) doesn't have an injury designation for Saturday's wild-card game against the Falcons, Alden Gonzalez of ESPN.com reports. 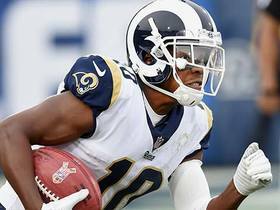 Analysis: Head coach Sean McVay hinted all week Cooper would be OK for the Rams' playoff opener, and the wide receiver upheld his end of the bargain with a full practice Thursday. Expect Cooper to handle the bulk of kickoff and punt returns Saturday, but snaps on offense will be few and far between behind Robert Woods, Sammy Watkins and Cooper Kupp. Head coach Sean McVay said Wednesday that he expects Cooper (shoulder) to play Saturday against the Falcons, Alden Gonzalez of ESPN.com reports. Analysis: Despite missing both practices to date this week, Cooper should be available in the wild-card round. Assuming he suits up, he primarily will contribute as a returner as the top of the Rams' receiving corps is otherwise healthy at the moment. Cooper (shoulder) didn't participate in practice Tuesday, Myles Simmons of the Rams' official site reports. Rams head coach Sean McVay said Cooper's teammates Robert Woods, Sammy Watkins and Cooper Kupp (knee) won't get much playing time, if any, in Sunday's game against the 49ers, Rich Hammond of the Los Angeles Daily News reports. Analysis: Selected to the Pro Bowl as a return specialist, Cooper caught nine of 13 targets for only 54 yards all season. He figures to get plenty of snaps in Week 17 as the Rams rest a number of starters, but he'll have to catch passes from Sean Mannion instead of Jared Goff, without the services of LT Andrew Whitworth to keep the 49ers' pass rushers at bay. Cooper caught one of two targets for one yard during Sunday's 43-35 loss to the Eagles. Analysis: The Rams' offense has been hot of late, with 25 or more points in seven of eight games. Cooper, as the fifth receiver, hasn't gotten much into the fun. The second-year receiver saw the field for just seven of 48 plays on Sunday and has yet to top 22 yards or score a touchdown in a game this season. Cooper caught both his targets for 12 yards and recorded 81 yards on punt and kickoff returns during Sunday's 33-7 win over Houston. Analysis: The sophomore out of South Carolina was only on the field for 10 of 66 offensive snaps, and he's clearly behind Robert Woods, Sammy Watkins and Cooper Kupp on the depth chart. However, with Tavon Austin working primarily as a change-of-pace rusher out of the backfield, Cooper may have leapfrogged him in the targets pecking order moving forward. Still, outside of settings rewarding Cooper for his work on special teams, his fantasy value is extremely limited. 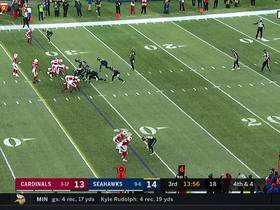 Arizona Cardinals wide receiver Pharoh Cooper loses 6 yards on the punt return after being smothered by the Seahawks defense. 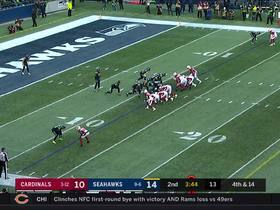 Arizona Cardinals wide receiver Pharoh Cooper makes a great punt return, taking a 54-yard punt and returning it 45 yards back to the Seattle 21. NFL Network Insider Ian Rapoport brings the latest information on the knee injury to Rams kick returner Pharoh Cooper. 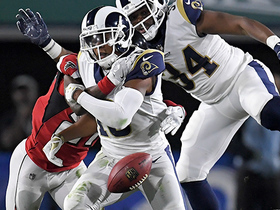 NFL Network's Michael Silver discusses Los Angeles Rams wide receiver Pharoh Cooper struggles in the Rams playoff loss to the Atlanta Falcons. 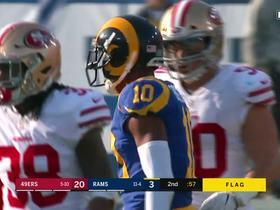 Los Angeles Rams quarterback Sean Mannion connects with wide receiver Pharoh Cooper for a 26-yard gain. 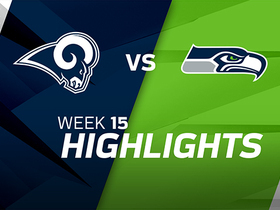 Los Angeles Rams wide receiver Pharoh Cooper made big plays on special teams to help the Rams to a 42-7 victory over the Seattle Seahawks in Week 15. 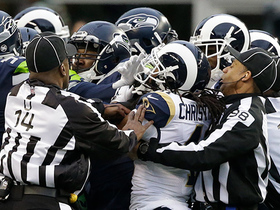 Seattle Seahawks Delano Hill is ejected from the game after tempers flair.